A private sightseeing helicopter had to make an emergency stop in the Hudson near 79th Street at around noon on Sunday after the aircraft lost engine power. Thanks to what FDNY Deputy Chief Thomas McKavanagh called the pilot’s “terrific job,” he and his four passengers escaped unharmed, though they did have to spend about ten minutes bobbing in the water until rescue crews arrived. 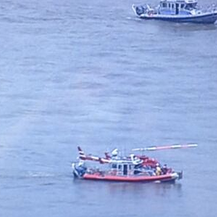 Meanwhile, the chopper briefly floated southward until the FDNY managed to tow it to 30th Street. Call it a mini-Miracle on the Hudson.